← Can GPS Make You Lazy? 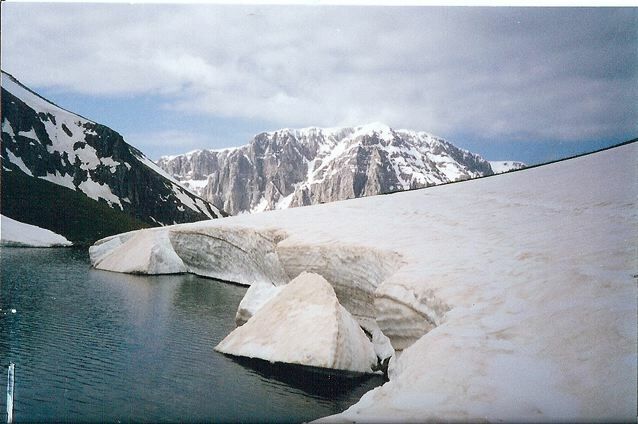 The Pindus Mountains are situated in the north of Greece near the Albanian border. In 2001 I spent ten days exploring this extraordinary area. 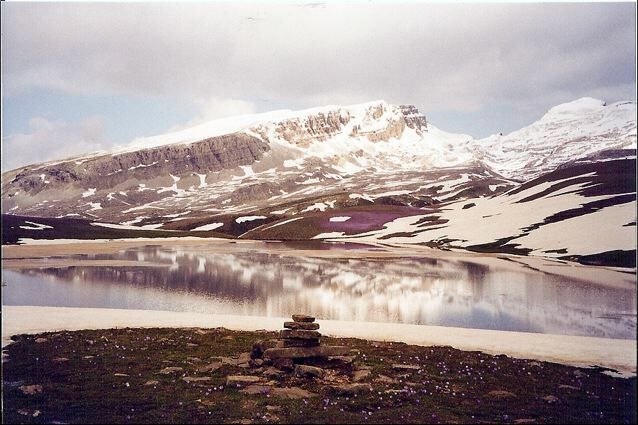 One of the highlights of my stay was a multi-day trek called the Pindus Horseshoe. 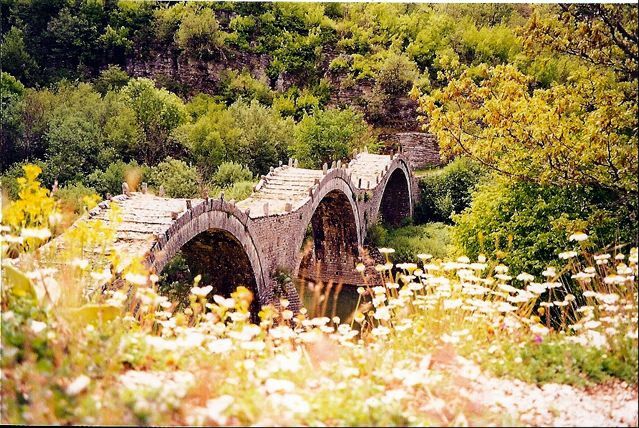 Beginning in the village of Monodendri, the hike combines gorges, alpine lakes and jagged limestone peaks with centuries old stone villages, monasteries and LOTR-like Zagoria bridges. An unforgettable fusion of natural, historical and cultural elements. All logistical details have been updated as of November, 2016. Distance: 36 miles (58km) – including sidetrips to Gamlia 1 and Astraka. Click here for transport information to and from the Zagori region. Anavasi (publisher) 1:50,000 Zagori Topo map. Your best bet is to pick it up online before you go. Alternatively, you may be able to purchase a copy in Ioannina, Monodendri or the Mikro Papigo Visitor Center. Bill Birkett, Classic Treks (2000). Great photos and a basic description of the route. Trekking in Greece (Lonely Planet Guides – 1993) – An oldie but a goodie. Out of print; occasionally you can find second-hand copies on Amazon. The Mountains of Greece: Trekking in the Pindhos Mountains (Cicerone Press, 2010) – A much more current option. I haven’t personally seen this guide, but in some twenty plus years of regularly using Cicerone trekking guides, I’ve yet to have a bad experience. If I was hiking in the Pindus mountains again, I’d take a combination of this book and the 1:50,000 Zagori map mentioned above. For online information, check out the Pindos/Vikos Circuit page on the Walkopedia website. 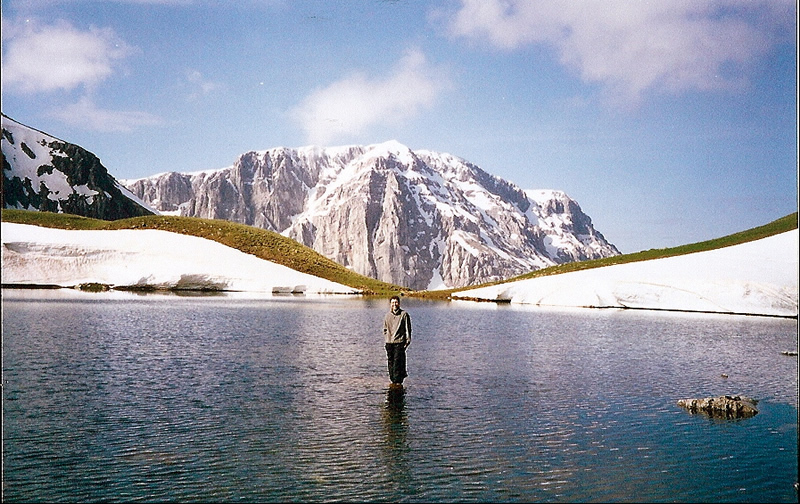 Walking on water | Dragon Lake. 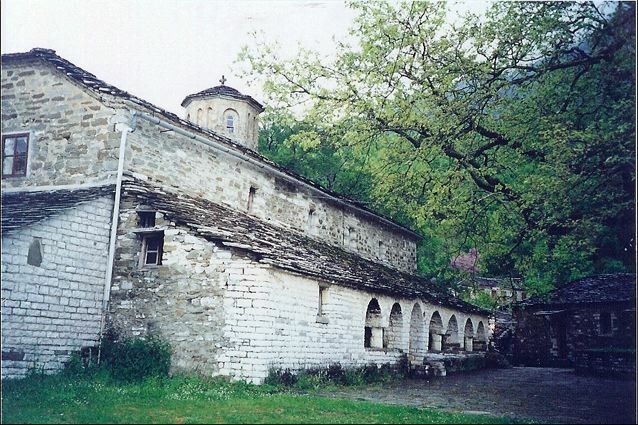 Be sure to visit Ayias Paraskevis monastery (founded in 1413) before setting out from Monodendri. 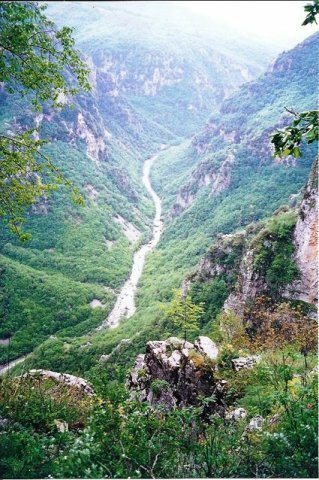 It’s just 15 minutes walk away, and the views over Vikos Gorge are well worth the effort. 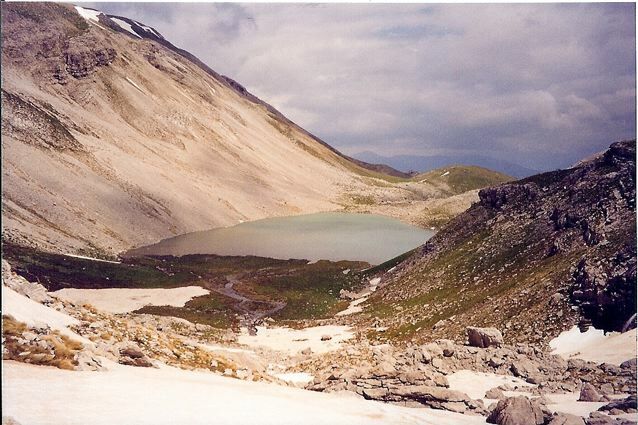 The interconnected trails and mule tracks which make up the Pindus Horseshoe are well trodden and easy to follow. Many of the pathways are centuries old, and until relatively recent times represented the only way in which some of the more remote Zagori villages could be accessed. Take a compass/GPS, consult your maps and trekking notes regularly and never miss an opportunity to confirm directional choices with friendly locals. Natural highlights of the hike include the Vikos gorge (listed as the world’s deepest in the Guinness Book of Records), jagged limestone peaks and alpine meadows filled with wildflowers if you happen to be hiking in May or June. Water: I chose not to treat water taken direct from springs or sources situated above grazing areas. I didn’t have any intestinal issues. In lower, more trafficked sections, it would be wise to treat or filter. 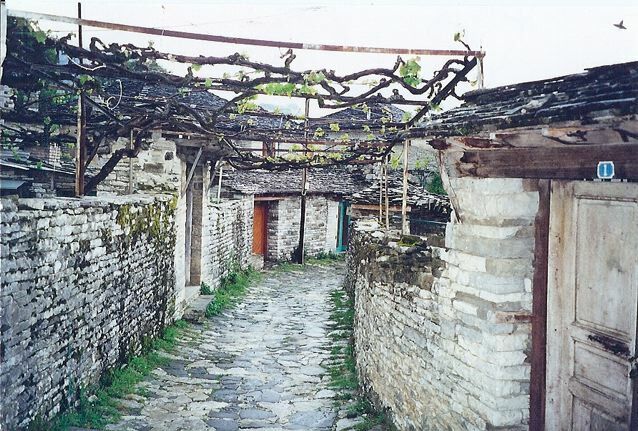 Accommodation is available in the ancient stone villages of Mikro Papingo (not to be missed) and Tsepelovo. There is also a mountain hut at Astraka Col. Although officially illegal, “wild” camping is possible along the route so long as discretion and no trace principles are practiced. 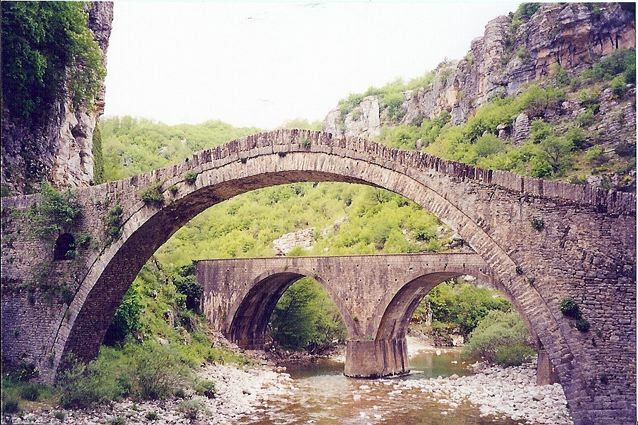 Ottoman era Zagoria bridges were amongst the highlights of my time in the Pindus mountains. While you’re in the neighbourhood……. If you’ve come all the way to northern Greece, another “must see” destination is Meteora. 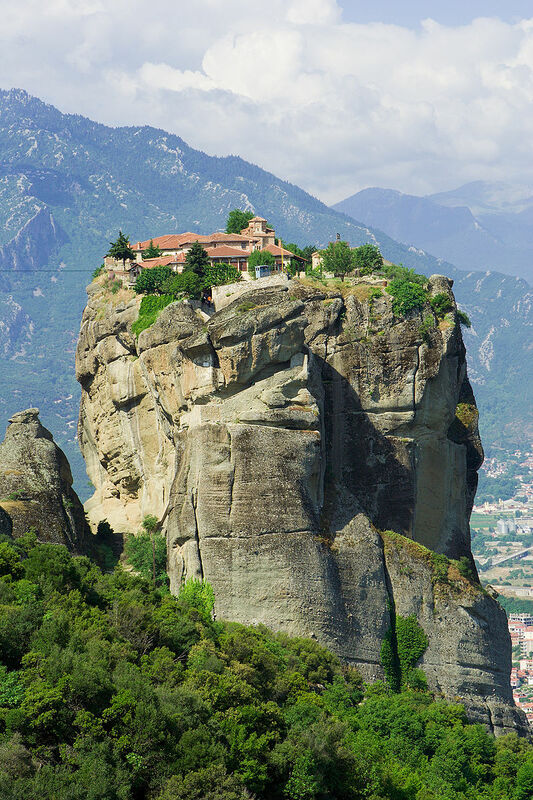 Situated only a few hours drive from the Pindus mountains, Meteora boasts an amazing collection of rock monoliths with centuries old monasteries perched on top of them. (Note: For all you James Bond fans, the Meteoran Monastery of Agia Triada – pictured below – was featured in For Your Eyes Only). Agia Triada Monastery | Meteora. Note: What follows is a brief account of my first night on the Pindus Horseshoe trek. 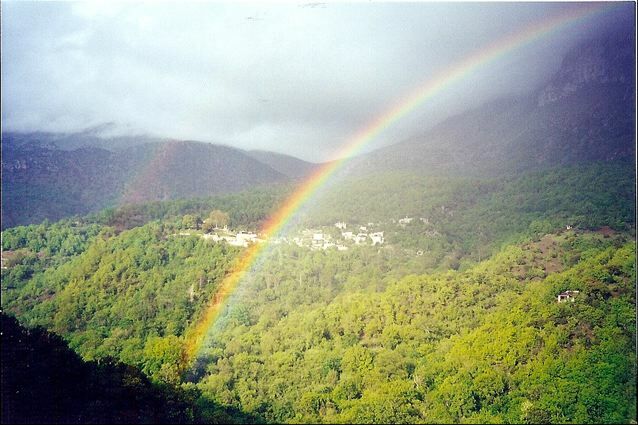 Mikro Papigo is a beautiful stone village situated in the Pindos Mountains of Northern Greece. After a memorable first day’s hike through the Vikos Gorge, I arrived late afternoon, greeted by a picture-perfect rainbow. I wandered into the village and headed straight for a hole-in-the-wall restaurant/tavern, the name of which I can’t recall. Not long after sitting down, I struck up a conversation with a gay couple from Germany over a few beers. We shared numerous funny stories about the colourful night life scene in Berlin. After a while, the girls and I were joined by a Greek husband and wife, who upon overhearing our conversation and having spent quite a bit of time in Germany themselves, pulled up a couple of chairs and our international group became five. Many more beers and quite a few Ouzos later, we eventually said our goodbyes. It was around this time that it occurred to me that in the process of the night’s festivities I had forgotten all about finding accommodation. Not to worry; I knew where I needed to go. I made a beeline for the centuries old village church of Agioi Taxiarches, where I lay down my mat in the vestibule (see photo below), slipped into my sleeping bag and drifted off to the land of nod. 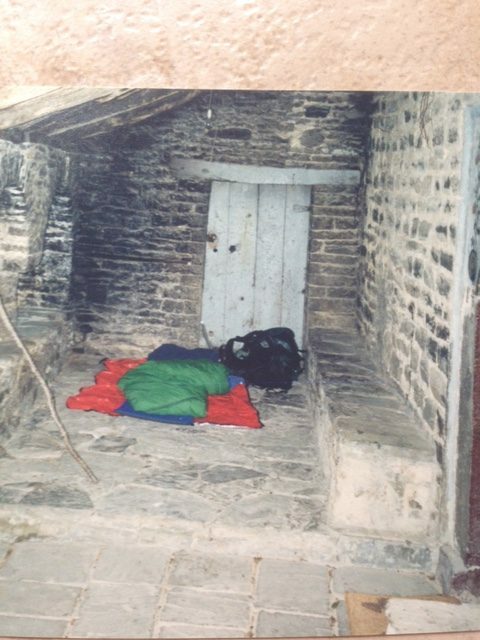 Postscript: I was awoken the next morning by a middle-aged Greek lady, who upon spotting a stranger sleeping in the local church, had come to the conclusion that I was down on my luck foreigner who couldn’t afford accommodation. As a result of her semi-accurate supposition, I was brought a breakfast of yoghurt, olives, bread and one of the best cups of coffee I have ever had! Home sweet home; the vestibule of the Agioi Taxiarches church. Great info about maps and literature! I was thinking about April. Do you think that’s too early weather wise? Thanks for the message. There may still be a bit of snow around on the high areas and in the gorge in April. That said, I wouldn’t let it stop you from visiting! All the best on your trip. Having read your very interesting, and enjoyable, report here, I’d be most grateful for your help. 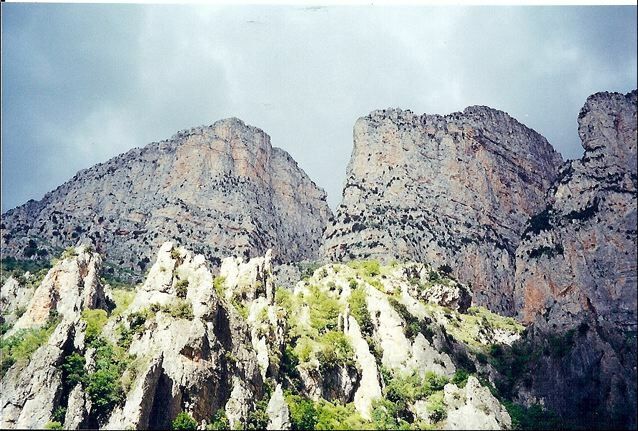 A group of us walkers from London, with many years’ experience of walking in Britain as well as in mountainous areas of Europe, are thinking of a hiking trip in the in the Pindus Mountains, with the Vikos Gorge a main consideration. Though a fairly vigorous walker, I’m the only one in the group who may be seized with vertigo on exposed paths. In order to avoid holding up everybody else on our hikes as well as possibly putting myself in danger, I make an effort to try and find out whether walking in an area proposed by our leader could cause me problems. I wonder what advice you could give me from your experience of walking in the area concerning the risk of vertigo on its paths, and whether you’d suggest anybody else I should ask. It has been 18 years since I hiked in the Pindus, but I can’t recall any sections of the Horseshoe route that were particularly vertiginous. Perhaps the cliff hugging side trip to Agia Pariskevi, situated near the starting point of Monodendri. All the best for your trip! I have been looking into hiking in April also. I have been told that the Vikos gorge may not be passable until after May 1 due to high waters. Not sure if it is officially closed. But I know Samaria Gorge on Crete is officially closed until May 1. So I recommend checking.